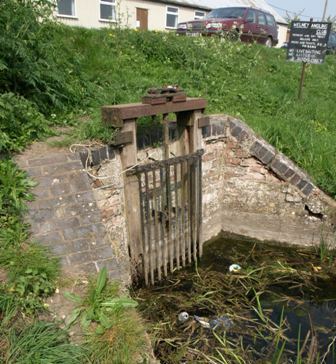 There is what is called in this part of the world a 'slacker' - a small sluice gate - on the western bank of the Old Bedford River a few yards north of the bridge at Welney. Many casual observers may assume it is just another outlet from a man-made drainage system, or possibly an irrigation inlet. In fact it leads to part of an ancient natural fen waterway, known by various names over the centuries, but now named on modern Ordnance Survey maps as the Old Croft River. This river is like a worm that once wriggled fat and juicy over the fen lands from Littleport to Wisbech, but having been cut up during various Fenland drainage schemes is now just a number of withered independent sections, some dead, others clinging to life. In the early years of the 17th C, when it was known variously as The Old River of Welney, Old Wellenhee (river), Welney River or Welney Water, it was cut though at Three Holes when Pophams Eau was dug (a drainage channel from nr March to Nordelph named after Sir John Poham). Twenty five years later, in the 1630s, the (Old) Bedford River and its embankments were cut through it at Welney by Vermuyden. Twenty years on it was again severed by Vermuyden, this time at a place known later as Suspension Bridge, when the the New Bedford River was cut in 1652, and about a hundred years after that the River Delph cut though it again at Welney. If visted before, please "refresh" page to see latest version. From Darby's The Changing Fenland, based on 1934 work by Maj Gordon Fowler In earlier centuries it had been a grand river with a wide flood plain, part of an important link in the vast and ever changing waterway network of East Anglia. As long ago as the 11th and 12th centuries it was the course of the Great Ouse from Ely to Upwell where it joined the Nene and proceeded as the Well Stream to the sea at Wisbech, a port then on the coast. It was a busy commercial river and it is said that stone for Ely Cathedral was carried along it 1106-1189 from the quarries at Barnack in Northamptonshire. In the Assize Roll of 1245 it was recorded as the "Aqua de Welle". 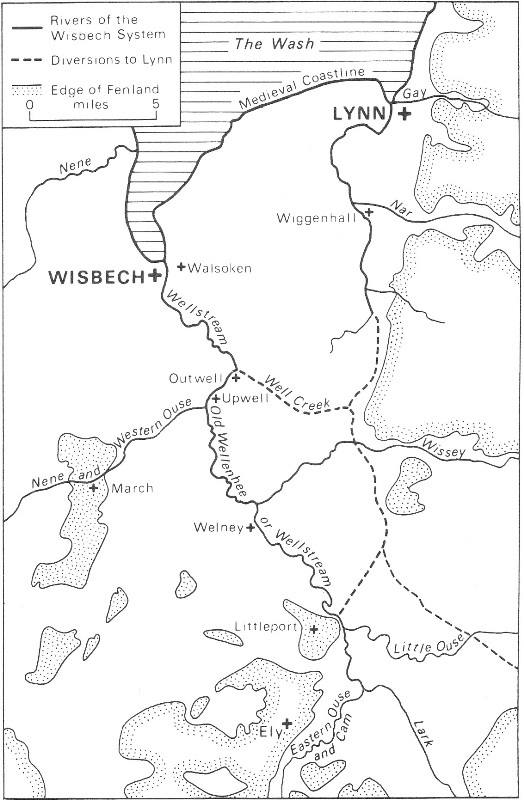 During the 13th C the Wisbech estuary became choked with sand and silt and much of the Wellstream turned southeast at Outwell into Well Creek and eventually to sea at Kings Lynn (see map on left). 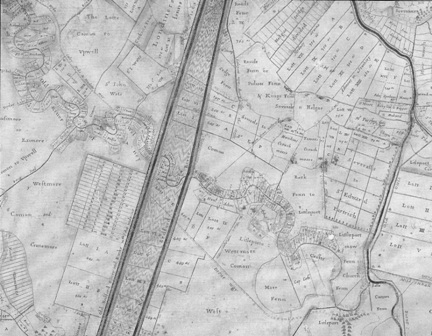 The first Ordnance Survey (OS) maps in the 1820s and Samuel Wells' 1830 map, name the river from Welney northwards as Old Welney River, and the southern section, to the east of the washes, as Old Croft River. At some stage OS adopted the latter name for both sections. 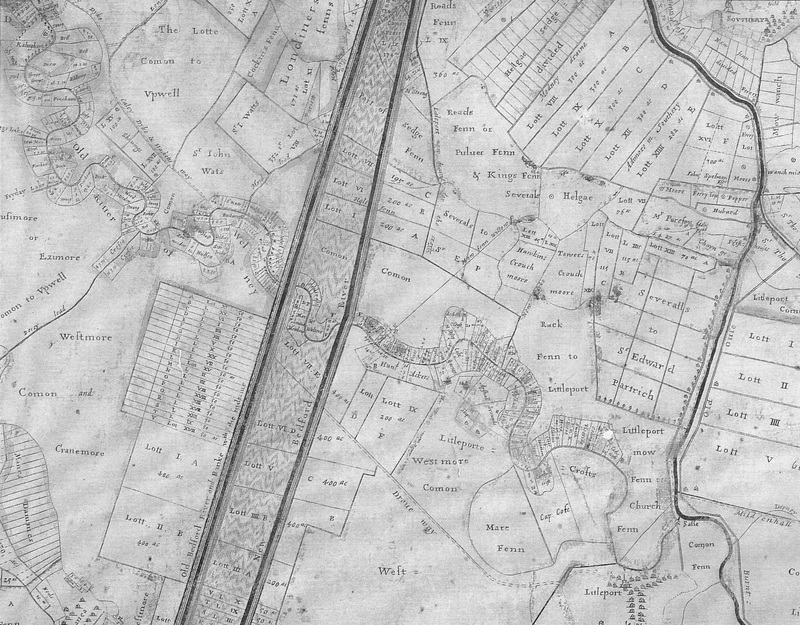 Prof. HC Darby suggests (The Changing Fenland, 1983, pp34) that the origin of the name Old Croft River was taken from Jonas Moore's late 17th C map showing a line of old crofts (smallholdings) on the old flood plain. workshop on left. Signalbox on right. The 2006 OS explorer map shows a short waterway named Holmes River running along part of the east side of Station Road in Littleport. The IDB's district map shows the source to be a culvert under the railway, presumably fed from the end of the dockyard/marina on the other side of the railway. I feel certain that the marina, dock and Holmes River mark the course of the Old Croft. 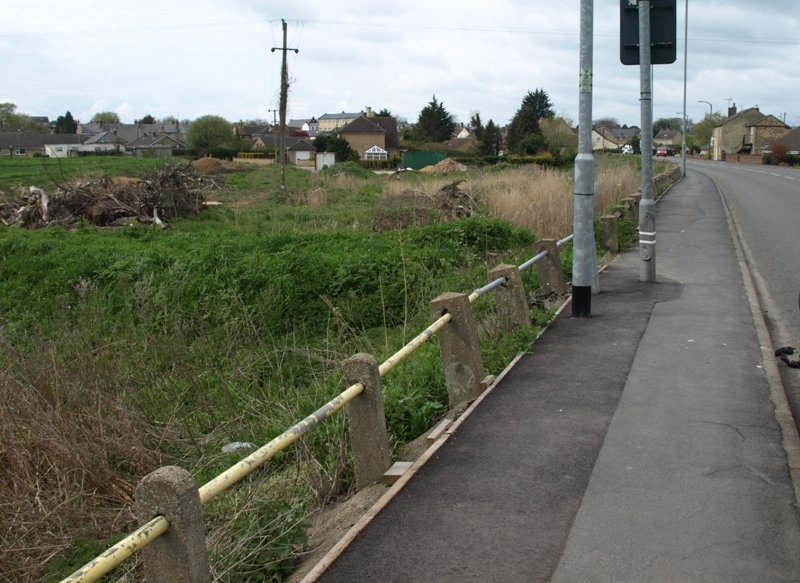 When I visited in Apr 2012 part of this short stretch looked clean and tidy, but horrible by the dock/railway end, and drained and neglected at the other end. The almost dry ditch beyond the slacker ends completely where a drive to a bungalow is built across it. Some of the dried-up parts of the river are "roddons". 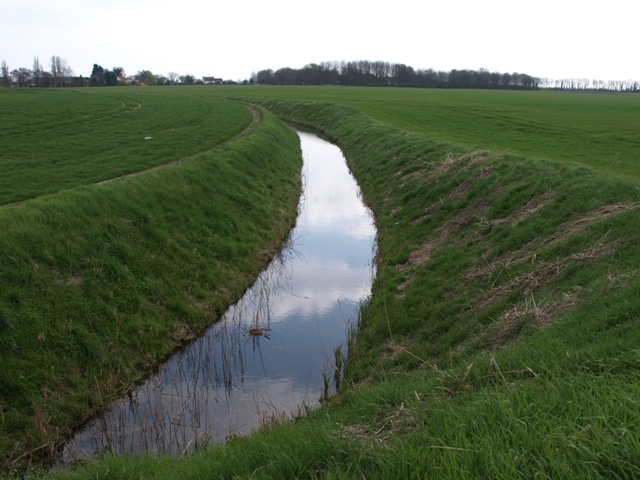 A roddon (or rodham, roddam or rodden) is the dried bed of a fenland watercourse where surrounding peat lands have dried and shrunk leaving the silt-filled river bed and banks as a raised ridge. Roddons make good firm land for buildings and roads, and Silt Road in Littleport, which joins Station, Road did not get its name by accident. 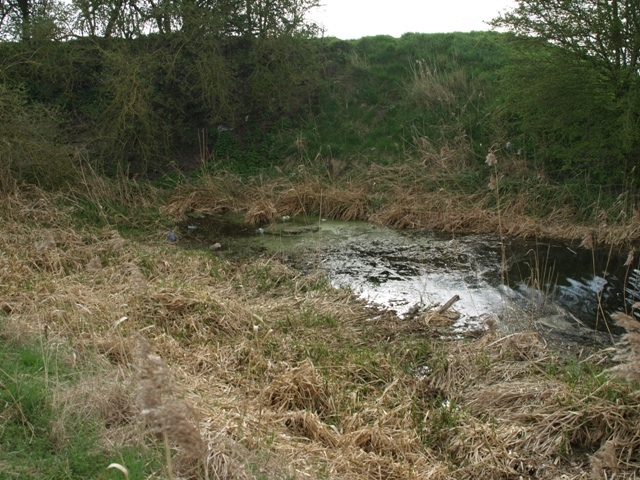 Surveys at Camel Road in Littleport and further north around Apes Hall have revealed Roman industrial activity along the river which being tidal and therefore saline and with broad sandy banks provided ideal conditions for salterns - salt extraction works - and the surrounding peat fueled the process. Both sites have also revealed broken pottery from 2nd C Romano British domestic activity. Rex Sly gives an excelent account of Roman and Saxon salt production in his 2003 book From Punt to Plough and Tom Howard describes Roman activity in his 2007 book, The story of Apes Hall. On a brief visit in June 2012 to Hale Drove and the area of the old crofts I was unable to see any trace on the ground of the course of the river shown on maps. Perhaps a winter visit may be more revealing. After the pool the river clears up along the road. This is the only part within the area of my project (exploring the Ouse Washes) but there is little to see here, which is why I wandered off course to explore the northern and southern sections. Look at a modern OS map of the Washes and you will see virtually all the internal ditches run in straight lines across the washes or parallel to the rivers. There are a few exceptions, among them one each side of the Welney Wash Road (A1101) and two others a little south of the road. One of those four may mark the line of the Old Croft River, although none of them entirely follow the course shown on Jonas Moore's map. These ditches are fed from the Cradge Ditch running alongside the New Bedford River and they drain into the Delph. My guess is that the old county boundary across the Washes followed the line of the Old Croft River. This section is within the drainage district of the Hundred Foot Washes IDB, which is responsible for the Cradge Ditch but not for the ditches fed from it. Photo above courtesy of Peter Cox. All other photos by Eddy Edwards. The old wooden slacker and outer metal grill seen in April 2011.. When I first posted this page I said the section west of the Washes is in the Middle Level and is the responsibility of the Upwell IDB. Soon after, Mr Graham Nunn, Foreman of Upwell IDB, e-mailed to say that "from Welney to Tipps End the centre of the Old Croft river is the border between two IDB’s, Manea and Welney IDB [to the south] and Upwell IDB. At Tipps End Upwell IDB take sole control". I am grateful to Mr Nunn for the correction. Mr John Hartley, Chairman of the IDB, said in the 1990s that the Old Croft did not perform a useful drainage or irrigation function, and to save the expense of maintaining it they would like to fill it in. Fortunately for the residents of Welney that hasn't happened and the river is mechanically "slubbed out" (cleared) every couple of years by the IDB's staff, and the banks are generally kept neat by farmers/landowners. The slacker that feeds it from the Old Bedford was replaced in September 2011 with a new Dutch made 'penstock' (which is what slackers are called elsewhere) suplied and fitted by Martin Childs Ltd (MCL) on behalf of the IDB. It has a 316 stainless steel frame with a high-density polyethylene (HDPE) gate (source: MCL). The previous slacker, which dated from the mid-1980s, was wooden and had been rotten at the bottom for some years (source: IDB). I understand that the IDB retained the existing cill, the level of which is shown in the EA's Ouse Washes Water Level Management Plan (OW WLMP), 2002 as 0.90 AOD on p39 and slightly more, 0.91m, in appendix 10d. 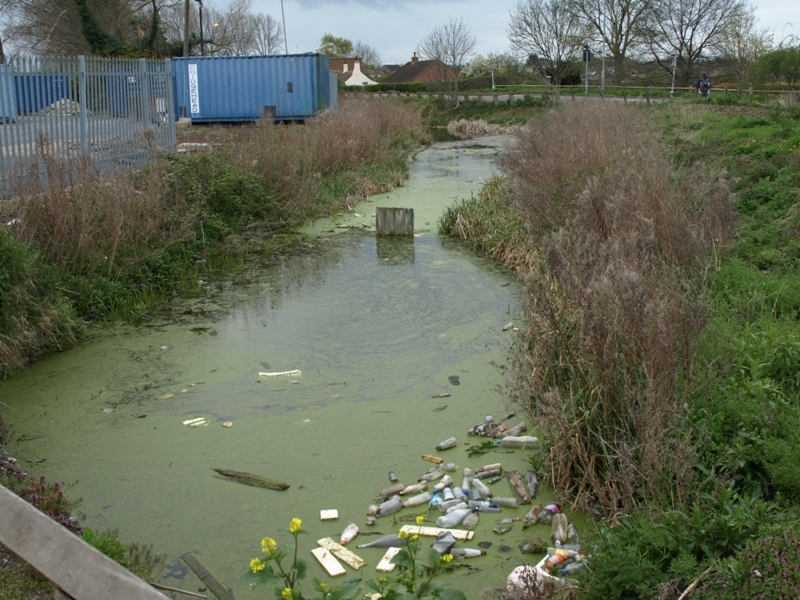 The latter figure is also the "summer target level" for the Counterdrain/Old Bedford River (OW WLMP, 2002, p15). If the cill and target levels are the same, the Old Croft could only a flow if the CD/OLB was above the target level, so maybe the lower figure is correct? According to one of my Welney contacts, one of the objectives of an earlier OW WLMP, that of 1996, was to reduce the cill level to allow an increased flow to enhance the water quality of the Old Croft through Welney - proposed by the local parish council but not agreed by all parties. It would be interesting to know whether the opportunity to lower the cill was considered. The slacker is controlled by the IDB (by agreement with the EA ?) and normally is set to allow just sufficient flow to avoid stagnation. 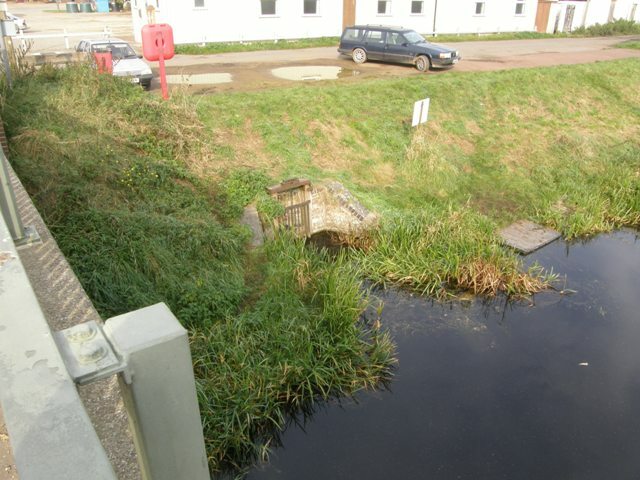 The water then runs north-east through a pipe (I guess about 2ft or 600mm diameter), and at some stage under the A1101, emerging on the south side of the road (Main Street, Welney) north of a house named The Hives. After just 25 yards it goes underground again at Laburnum Cottages and remains covered passing the Old Post Office, the entrance to the school and Croft House. North of the latter, it re-emerges and remains open except where it is crossed by various small access bridges and piped under New Road. 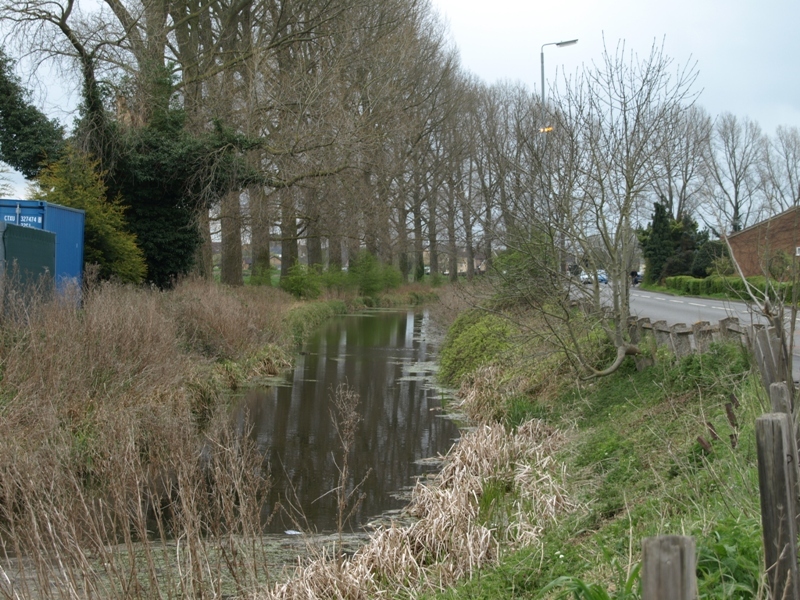 The river then runs alongside Wisbech Road (A1101) through Welney, with some fine houses each side but mostly on its south/west bank, then heads west away from the road at what is known locally as Clayton's Corner where the road bends sharply northwards. The river then turns back south for a while, before curving northwest and meandering through fields, under Wisbech Road Tipps End, then generally northwards through more fields to the east of Christchurch. Some stretches through Welney suffer from a common problem these days - a covering of "cott" - a green algae often called blanket weed, whilst other parts remain clear (unless the foul-smelling black slime at the bottom is disturbed!). A great loop in the river east and north of Christchurch past Halfpenny Toll Farm is now by-passed and mostly dry and difficult to see, the IDB directing the flow by Beechwood Farm. According to Wells writing in in 1830, Half-penny Toll was one of several private tolls "placed in lieu of ancient ferries". I presume that means a charge for using bridges where once a ferry operated. The river continues towards Three Holes, passing Primrose Hall Farm where it is crossed by the course of the old Roman Road called Fen Causeway which ran between Denver and Peterborough. Dugdale writing in 1662 says it was 60 feet wide, 3 feet deep and made of gravel, now covered with 3 to 5 feet of "moor" (clay/silt?) - showing that rising sea levels and consequent silt deposit had raised ground levels in the 1100 years since the Romans left England. Beyond that it flows past Ralingham Hall, a large red-brick grade II listed farmhouse said to date from c1660 (a building is shown on Moore's map) and extended & altered since with the original thatch replaced by slates. In 2001 Mr RA Deptford was granted planning permission for conversion of a barn on the adjacent farm to a 6-bedroom dwelling. The new slacker seen in Dec 2011 has a plastic gate and stainless steel frame and operating rod. 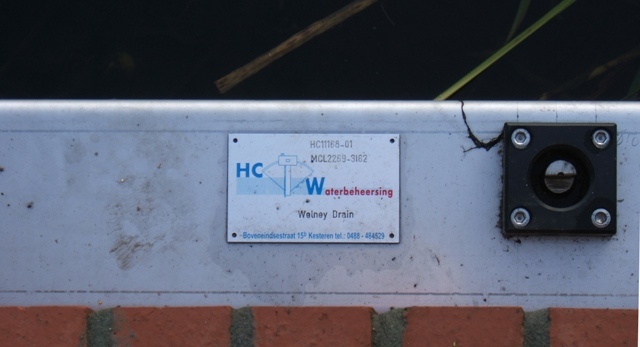 The top of the new slacker shows the name of the Dutch manufacturer, and "Welney Drain". The IDB's foreman says that name was chosen by the manufacturer, not by the IDB who have always called it the Old Croft slacker. At Three Holes, the river goes through a slacker on the south side of the barrier bank of the Middle Level Main Drain (MLMD). From there it is piped through the bank and into the drain about 600 yards south west of Three Holes Bridge. 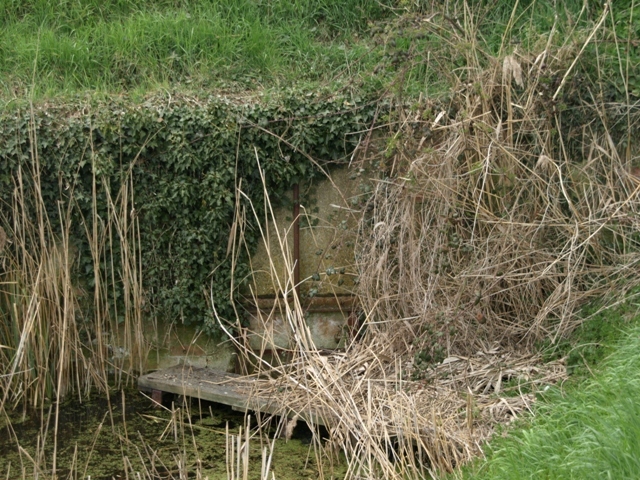 On my visit to Three Holes in March 2012, the control rod of the slacker appeared very rusty and overgrown by ivy and the surrounding brickwork on both sides of the embankment was in a poor state. The area between the slacker and the outfall into the MLMD was overgrown by elder and bramble and the outlet was weedy, strewn with discarded drinks cans & plastic bottles and generally unattractive, comparing unfavourably with the banks of both the Old Croft and the MLMD which were grassed and tidy. The brickwork looked as though it may date from when the MLMD was cut in 1844. and little done to it since. Several thicknesses of brick were missing in many places leaving one metal wall-plate in mid-air. "On the outlet end at Three Holes the old slacker door has not been used for years as two channels have been welded on the front and we use overspill boards to control the water level. The reason the outlet side is in such a state is that our board actually finishes at the outlet door, the other side belongs to the Middle Level Commissioners". I ought to add here that Graham uses the word "outlet" to indicate where the water leaves Upwell IDB's district on the south side of the MLMD barrier bank. I had used the same word to describe where the water from the Old Croft enters the MLMD on the north side of that bank, but have now changed that to "outfall" to avoid confusion. 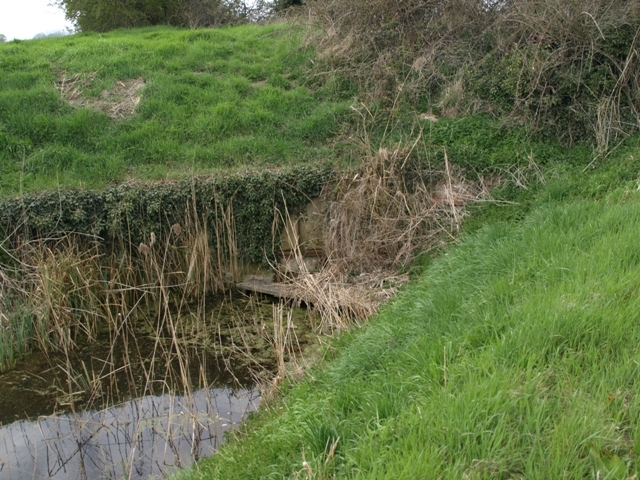 outfall into the MLMD is under a small arched bridge. 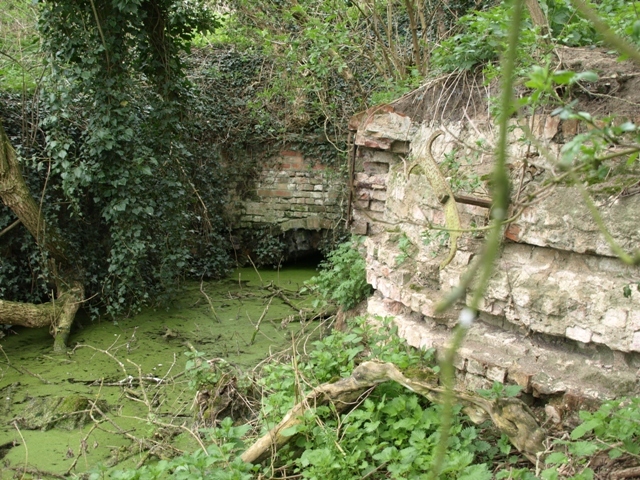 From c1605-7 to 1844 the Old Croft flowed into Pophams Eau rather than the Middle Level Main Drain as described above. Today, a further section of the Old Croft is marked on OS maps north of Pophams Eau, running along the south and west side of the B1412 almost to Well Creek. In places it is far wider than a normal field ditch but sadly it is virtually dry. Once it would have joined the Creek, or the Old Nene as it used to be, at Shrewness, a point now marked by a house named Shrewness Villa built in 1897. The Old Croft now ends a little way short of there, on the south side of Workhouse Lane, and some locals told me it had been like that for at least 50 or so years. This section is on the bounday of the Churchfield & Plawfield IDB district, but is not one of their maintained drains. Article by William P Smith in "Welle in Touch"
Passage taken directly from documents written before the 17th century also contains modern interpretations. "ln the time of Adam de Boothby, abbot of Peterborough, there was an indictment at Northampton against a stoppage of the water at Upwell, so that the river Nen could not have its course to Lynn; whereby the counties of Northampton, Lincoln, Bedford, Huntingdon, and Cambridge, were much endamaged; and a decree was procured from Geffrey Le Scroop. the King's chief justice, for clearing the passage. And it appears by a presentment of the jury, made in the 3d of Edward lll. that the course of the water of the Nene, came from Peterborough, through the limits of Upwell, and that Walter de Langton Bishop of Litchfield and Coventry, asurer to King Edward l. in order to drain his manor of Coldham in that neighbourhood, stopt the course of the river with earth and sand, to the great damage of the country. 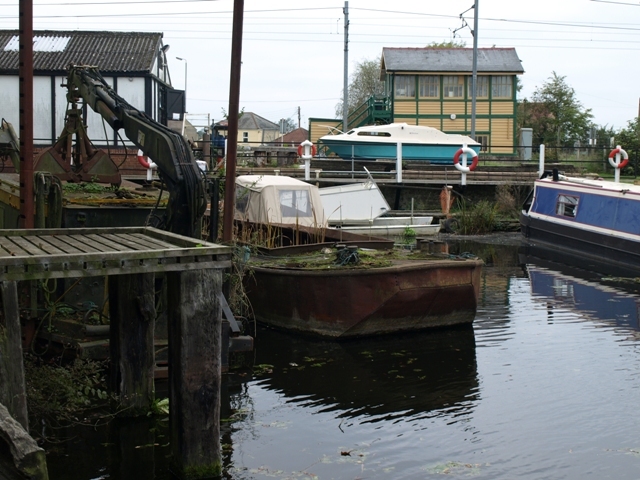 They say on their oaths, that the river Ouse, descending from Huntingdon, and the river Nene from Peterborough, met at Benwick, had used to run directly thence to the port of Lenn, by Outwell; and that by the said stoppage, no navigabable vessels could afterwards pass to and from Lenn as they had wont to do. And Dugdale observes that the river Ouse, whose current now discharges itself into the sea by Lynn, passed in King John's time, under the town of Littleport in the isle of Ely, and so on to Wellenhee, (Welney,) and through the two towns of Upwel! and Outwell, whence it had the name of Well Stream, and so under Walsoken sea bank, through the washes between Lincolnshire and Marshland. into the sea; where the river Nene, that comes from Peterborough through Wisbeach, runs through those washes now. and slides into the sea". It seems by dropping the name "Well Stream" we have lost the most iconic waterway in Fenland. Phil Evans, MCL, new slacker info. Graham Nunn, Upwell IDB info. Text and photos except where noted © Eddy Edwards, 2010-12. Please do not use any material on this webpage in any publication or other website without permission. and your response will be added. 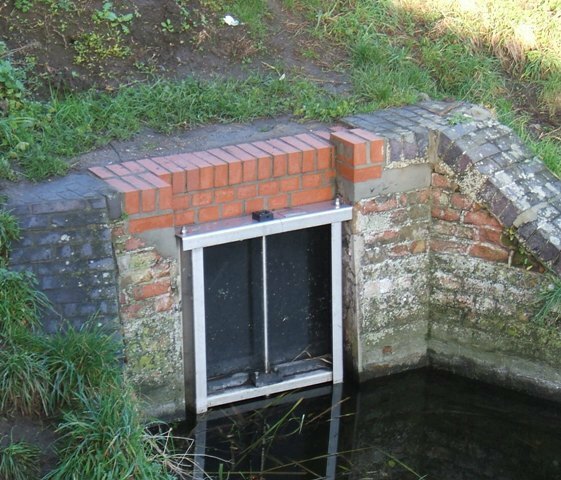 Most of the rivers and drains of East Anglia are listed and their courses described on the "Wisbech and the Fenlands" website, which also has a wealth of historical information about the area.